Maria, 32 from London, works in the education sector as a Sports Premium Lead, supporting primary schools in their development and provision of physical activity, health and school games. She explains how her career inspired her to become a volunteer on the Volunteers Supporting Families project. “I’ve worked in different roles in the education sector for the past 10 years and have found that there are many barriers to learning such as social and cultural issues, learning difficulties, financial constraints or the lack of parental engagement and involvement. With all of these factors impacting the holistic development of a child, they are still expected to achieve within a specific time, irrespective of their needs. 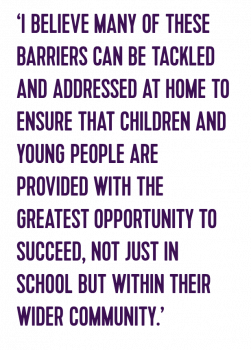 As a practitioner I believe many of these barriers can be tackled and addressed at home to ensure that children and young people are provided with the greatest opportunity to succeed, not just in school but within their wider community. This is what first inspired me to work with families. I met with Volunteering Matters towards the end of last year and was matched with the family I am currently supporting back in January. I’d had training prior to the first meeting and had received a case file about the family. I wasn’t nervous about my first meeting but I did feel a weighty responsibility. I’d never been in that scenario before, going into a stranger’s home to meet them for the first time as a volunteer. Mum did assess me through questioning which gave me the opportunity to share my vast experience across many industry sectors. Mum seemed confident in my abilities. She was open, happy and appreciative of the service and we agreed to start. Mum and I discussed the family dynamics, the needs of the family and agreed a support plan during the initial two visits. I met her boys on my third visit which was a lovely experience where I was able to share the reason for my support and the role they were to play to ensure the family outcomes were achieved. They were really open and we were able to communicate effectively. One of our goals was to improve the relationship mum had with one of her sons. What we hadn’t planned for originally was that mum needed support too to ensure she was in a place of emotional well-being. Supporting mum also became part of the plan. I definitely feel like I’ve made an impact over the past four months. Mum appreciates having someone to speak to and says she doesn’t feel alone. As volunteers we offer a different dynamic to the social care support system, a softer side. Mum feels like “she’s not getting paid to be here so she must really care, she must like me” which is true. I don’t do what I do for money hence why I am volunteering my most precious gift, which is time. I do it because I truly believe it’s important and vital for building a more cohesive community. I’ve learnt things about myself through volunteering too. I’ve learnt how to communicate even more effectively and how to be patient with myself as well as others. You have to be flexible too, not just with time but with the approach and strategies you implement. My contact at Volunteering Matters is great for that, she’s always available if I want to have a chat about a particular scenario, run idea by her and she’s always keeping me in the loop with interventions and communications from other services supporting the family. One of the biggest things I’ve got from the experience so far is the need for a heightened sensitivity to the needs of the family and the need for resilience. I also learned the importance of patience, particularly being patient with the speed at which a family is progressing. It might take longer than planned, it might take longer than the six months that I’m with them, but that’s ok. If Maria’s story has inspired you, find out more about Volunteers Supporting Families.